The part of the day that I was waiting for (and is one of the most significant reasons I wanted to be at CMK this year) was a talk from Carla Rinaldi, the president of Reggio Children. 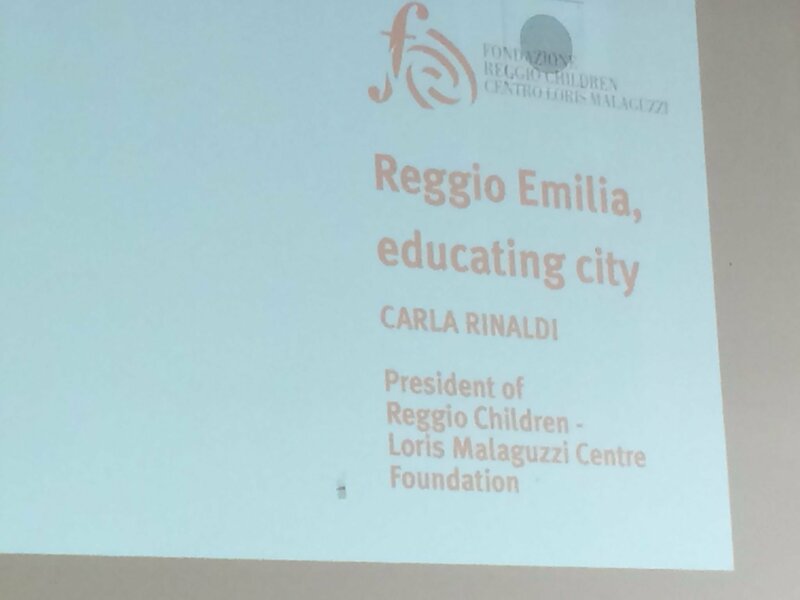 If you aren’t familiar with Reggio Emilia you may want to do some reading. (I highly recommend The Teacher You Want to Be, a collection of essays based on a study trip to Italy.) Carla is Italian and yet she spoke to us about the learning and teaching happening in Reggio Emilia in English. The idea of giving a talk to a large group in a second (or possibly more) language is astounding to me. I have so much to say about this talk I don’t even know where to begin. Part of it are still ringing in my head a day later (Trust the children. Relationships are fundamental. Make visible the competent child.) There is no doubt in my mind that I will continue to hear here words and her voice in my head for quite some time. I think hearing her makes that more true than reading does. There’s something so powerful about sitting ten feet from someone and listening to them that burns it into your memory. 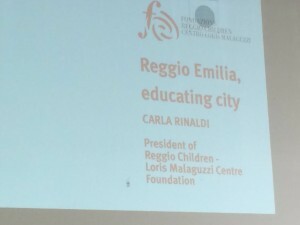 One of the first things Carla said (and yes, I’m calling her Carla in my head now) was, “We don’t only educate children and students, we are educating citizens.” What is happening in Reggio Emilia is unique in education, I believe, because children are seen very differently than elsewhere. 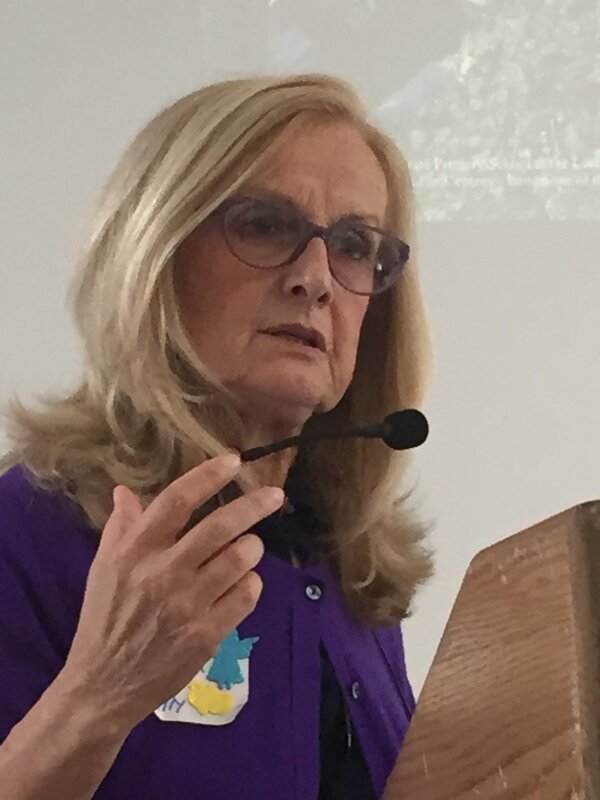 The first tenet of Reggio about which Carla spoke was “an idea of a child/human being as holder of rights and potentials.” Children are not seen as less than or incapable. Children are researchers, thinkers, learners, and teachers just as adults are. It is a switch that I believe has come gradually to me over my career. I’m sorry I didn’t get to it far sooner. The most ringing thing I heard from Carla yesterday was, “Trust the children.” She went on to say that it isn’t easy to do so but that the children have never betrayed us. Trust the children. What a different educational belief than the ones in which we live in our society. We don’t trust the children or the teachers. Trust the children. Again, it’s taken me years to come to this. How much precious time I wasted. Along the same vein, children and teachers are both seen as researchers in Reggio and they are interdependent. Children are researching and learning about their world and each other. Teachers are doing the same and especially researching and learning about the children in their care. Carla shared the classic story of Laura and the Watch, which you can read here in the sixth paragraph. That child, a ten month old, and that teacher are both clearly researching and learning. Finally, for the moment, Carla also spoke about the importance of relationships. Relationships between teachers and students are obviously critical, but she also spoke about the importance of relationships with peers. She also said, “The children taught us this.” It’s clear that the approach to learning and teaching in Reggio comes out of observing and researching the children in their care. The children taught us this.